What is a radiant barrier? There are two basic properties on which radiant barriers work: Reflectivity and Emissivity. First, the aluminum is reflective on the hot side, reflecting some of the heat back from where it came. Second, and most importantly, aluminum has a low emissivity of around 0.03. This means that only 3% of the heat is emitted to the air on the cold side. In order to benefit from both of these properties, the radiant barrier must be double sided and installed so that there is an air space or low density material (like insulation) on both sides. However, even if your installation only allows for an airspace on one side of the material, gathering radiant barrier information and installing will be extremely effective in both summer and winter. Radiant Heat: Heat transferred by radiation in the form of waves which travels through open space and is absorbed and reflected by the first solid object it encounters. Radiant Barrier: a material which blocks/reflects at least 90% (higher is better) of the radiant heat. Emissivity: the amount of heat which is "emitted" or radiated off of a surface to the surrounding air (lower is better). Bare aluminum radiant barrier will oxidize over time increasing the emissivity to around 0.20 and lowering the reflectivity to 80%. Some materials made from aluminum alloys can even be as high as 0.40 once heavily oxidized. 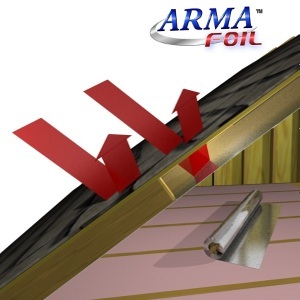 The best radiant barrier materials are sprayed with a specialized coating to prevent oxidation. This coating lowers the initial values slightly (e=0.05 and reflectivity=95%), however it prevents oxidation from destroying the reflectivity over time. 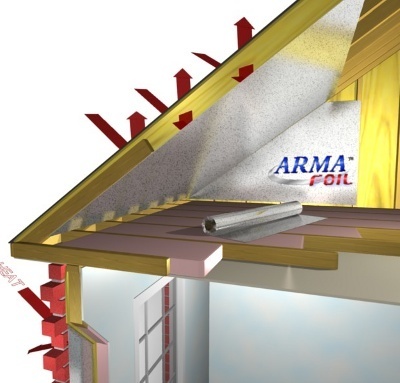 In an attic without radiant barrier, radiant heat from the hot roof travels down through the open space and is absorbed by solid objects including: ceiling joists, attic insulation, ductwork, and air handlers. In the summer, the single largest source of heat gained by your home or building is in the form of radiant heat. A large amount of this heat comes through the roof and ceiling. If you have spent any time in an attic on a summer day you understand this completely. The roof and walls of your home absorb the radiant heat coming from the sun. This heat moves by conduction towards the interior until it reaches an air space such as the attic or drainage plane behind your outer veneer. At this point it radiates across that space. If you have Radiant Barrier installed next to that air space, most of this radiated heat is reflected back towards the outside. Without Radiant Barrier installed, this radiated heat is absorbed by the interior surfaces of your home. In fact, regular insulation does little to reflect radiated heat; it just absorbs and holds this heat. In addition, HVAC equipment located in an attic will absorb attic heat and transfer it into the house. A properly installed Radiant Barrier can block up to 95% of this radiant heat, saving you money year after year. In the winter, heat conducts through your ceiling, walls and floor and is lost by radiation and convection. 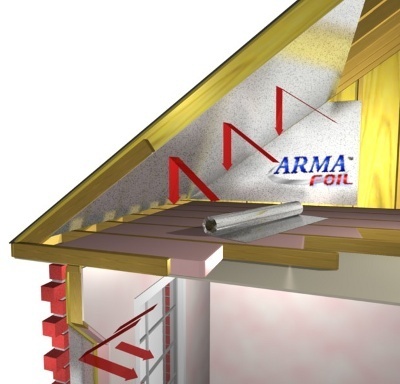 A Perforated Radiant Barrier installed in the attic will reflect much of the radiant heat back towards the source. Radiant Barrier used as a house wrap can reduce radiant and convective heat losses through the walls. When heat is lost through the ceiling, walls and floor, your home's heater works to reheat the space. Installing™Radiant Barrier properly can reduce this wasted energy by reflecting much of the heat back towards the interior of the building, keeping your home warmer and reducing your heating bills. As the cost of natural gas and electricity continues to increase, payback times decrease. If you are able to install Radiant Barrier yourself, payback times can be less then one year.